There are two master bedroom suites including a private bath, 3 king beds, 2 queen, and 1 full. Several of the bedrooms are 17 x 17 - HUGE! 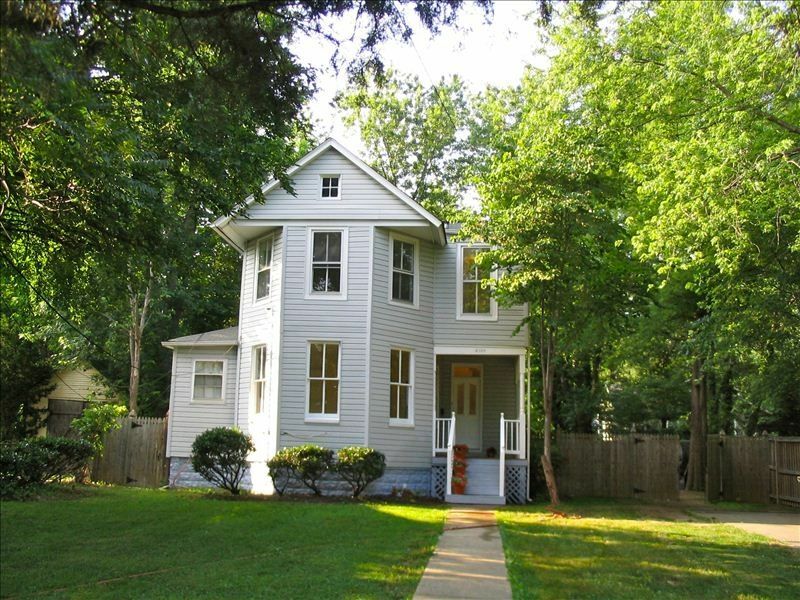 There is also a porch off the front and a large front yard with a completely fenced in backyard in the rear. Hyattsville, Maryland was incorporated in 1886 and this is one of the first plats of land laid out. I often like to think about the original owner of the home who made a living as a printer. The Windsors were married and raised four children in the home. The Windsor family expanded the home to the rear to make room for a growing family. This is a great neighborhood with lots of local coffee shops, restaurants, grocery stores and things to do right here with easy access to the museums, The White House, Capitol Hill, and Smithsonian. Hyattsville, Maryland has very easy access to Washington, DC. Written up in Washingtonian Magazine as one of the great places to live a “thriving middle-class community that’s both economically and ethnically diverse”. Large Kitchen: recently renovated with a gas oven and range, dishwasher and refrigerators. Laundry Facilities: washer and dryer, air conditioned and gas furnace heat home. Safety/Security: fire extinguishers upstairs and downstairs. Outside: Large front yard. Spacious Backyard that is surrounded by a privacy fence with a gate to front yard. Great for grilling out! Parking: In front of house for up to 4 cars. Pets: Welcome with Approval. Smoking: Non smoking property things to know: 10 minutes to downtown DC and University of Maryland. One block from bus on Rhode Island Ave. Close to 2 metro stations (PG Plaza and W. Hyattsville Metro Stops) and Marc Train. Great neighborhood restaurants - Franklins, Pluto's, Busboys and Poets. I love sharing my home with other families that enjoy visiting Washington DC. This is my full time business and I have been doing this now for years. I am happy to help share my expertise of what to do while you are here, order special flowers, or stock the fridge for you. Please don't hesitate to ask for something you need and I will do my best to take care of your request. Thanks again for visiting my home here in Washington, DC! PS REACH OUT TO ME TO SCHEDULE YOUR TRIP TO DC AND I WILL BE HAPPY TO HELP WITH ANY PLANNING OR QUESTIONS YOU MAY HAVE. Until confirmed prices are subject to change. All bookings require a signed rental agreement along with government issued ids for guests over 18. I just fell in love with the facade of this historic old home with all of it's charm and warmth. This home is located in Maryland, but is just over the Washington DC line. It's in an up and coming neighborhood with wonderful people and homes to visit. I have lived all over the United States and have just recently found out how wonderful Maryland really is. The neighborhood is a registered Historic District with many historic homes that have been renovated. My neighbors surrounding the property are a wonderful mix showing Washington DC flavor. Lawyer next door, young families across street, Grampa directly in front of house, Spanish lady who keeps the yard perfect, young family right next door. All are nice families and there are always people walking around in the neighborhood. From my picture, you can see how much I really enjoy spending time with new friends from Maryland. We are at one of my favorite places in Washington DC - The National Cathedral. The building is an amazing structure with beautiful stain glass windows, building structures and an outside garden. I always go the top of the church to look at the views whenever I go. Find the elevator in the front to see the most amazing views of Washington DC and the surrounding areas. We were here this day to attend the Ordination of a friend and I got blessed by the bishop. This property is only 15 minutes from Federal Express Field and the Verizon Center. We are 15-20 Minutes to Most Monuments and Sites People want to visit, 30 minutes from Annapolis and Baltimore. I think Washington DC is one of the best places to spend time with family and friends. There is just something here for everyone. Being a true Washingtonian, I wanted something close in to be able to easily visit Washington, DC whenever I wanted. Recently, we have had record snows here and I went out just to take pictures in the snow. I got photo's of new baseball stadium for the Nationals, The Capitol Building, The Smithsonian, Union Station, The 14th Street Bridge, The Cherry Trees covered in snow, the Washington Monument, The Jefferson Monument, The Lincoln Monument, The Roosevelt Bridge leading to JFK's grave and Arlington Cemetery, The Key Bridge, Georgetown, The Sequoia's, The Kennedy Center and then I went to Clyde's for a bowl of Chile and French Fries! I did all of this within 3 hours. OK, I admit it, there were very few cars on the road and I really love the snow. The photo's are awesome and it's a day I will never forget. Can you imagine what you can see if you stay here for a few days! This property is also located within Maryland's Historic Heritage Trails and there is lot's of history right near the house as well. There is not a better place to stay close to Washington DC and you really are close to everything! Visitors will love being right next to Washington DC and if you really don't like to drive, there are several metros within 10 minutes of the house. There is plenty of shopping in Hyattsville, an outdoor shopping area in Bowie, Maryland and if you love the water - don't miss a trip to Annapolis which is only 25 minutes east of the property. The views of the bay are amazing and there is more outlet shopping over the bay bridge which is approximately 4.2 miles running over the bay. There are some wonderful restaurants right near the house, Busboys and Poets is great for breakfast, lunch, dinner or just a latte along with wifi and great coffee. See my google map for more information on what to do right here in Hyattsville. There is a microbrew, Franklins which is one of my favorite restaurants within a mile of the house and if you want to try some down home cooking, try Carolina Kitchen located within PG Plaza and still very close to the house. There are also some really good Latino restaurants with really authentic food from El Salvador, Honduras and Mexico. There just were not that many homes built during the late 1800's and you can visit all of Washington, Maryland and Virginia from this property and really get a wonderful feeling of what our Nation's Capitol was like back then and today. The local farmers market in Riverdale within a 10 minute drive of the property even has a live band and yummy crepe's of all kinds. The Riversdale mansion was built around 1790 and includes tours showing how the one of the first mansions in America was really set up years ago. I really love it here! Have a wonderful time staying here! There is just no other place like it! Linens are all 300+ Thread Count! Comforters are Cotton and there are extra blankets as well. There are additional comforters for a few beds too! Energy Star Washer Front Loading. FREE Parking in Driveway for up to 4 cars with more parking 100' away. One Fluffy towels and washcloth for all! Leather Sofas, Local Brochures on things to do in DC, feedback from other guests, Large TV with FIOS Cable including HBO and SHOWTIME, DVD player, all make it easy to relax here. Large kitchen with plenty of room for everyone to help, gather or just catch up. Lots of light and space for everything. Long front Yard and Backyard is fenced in as well. Rentals are available in DC. Let me know what I can do to help you find what is needed for your special trip to DC. Located within the Anacostia Trails, this is a great location for biking historic trails around DC. Please bring your own bike. There is boating in Annapolis and rental in Alexandria as well. There is a small deck off the back which 2 chairs can be moved to. There is also a deck off the front of the house with steps leading to the front yard. Crew, Canoe and Paddle Boats available, please ask for more details. Within 1.5 hours of property. Tons of Golf around DC. I will be happy to help find you a golf course to fit your needs. This property has limited wheel chair capabilities. There are 6 steps to get up into the home. Once on the first floor everything you need is there including a full bath with shower including grab bar and elongated toilet seat. There is a 3-4 inch drop between main floor and hallway to bath. Bath is 5 x 8'. I love to share DC with others and have been here the majority of my life. I really know my way around and I am happy to help out with places to visit and insider secrets on where to park and how to get around. Please ask for additional assistance and I will be happy to help out. Very nice house with a home feeling. Rooms had comfortable beds. Loved the gas appliances. The house is in a good location not far from the metro. The owner was very helpful and gave us the hot spots to go near by. Would love to stay again. Thanks so much for taking the time to leave a review and for making a return trip this year. It was wonderful working with you again! Please come back and visit again soon! Great place to stay very close to D. C.
This was a last minute booking that worked out GREAT for both of us. I loved helping them plan out time in DC, pulling out a map, helping with best kept secret places to park - Union Station (Even fits Buses), suggesting downtown sightseeing and best place on the Mall to get lunch - The National Gallery of Art! Come back soon! There's lot's more to see and do here. I could even design a scavenger hunt for your next visit! So nice meeting you and your family! Thanks again for selecting my property! Spring Break April, 2011...School group from California consisting of fourteen 10-11 year olds and two teachers. Finding housing for a group this large was difficult, but Patricia graciously allowed us to rent her home. We absolutely loved the house-it was spacious and had everything we needed. The Hyattsville area is wonderful, especially the people-everywhere we went, we received outstanding treatment. Thank you so much!!!! Thanks so much for your feedback. I also find Historic Hyattsville Hills, Maryland and Washington, DC in general a wonderful place to live and visit! Within just a few miles of the house, there are museums, the Capitol Building, great restaurants and wonderful National Parks to visit. When I get bored (which is not often! ), I can always find something to do. There are regular parades during holidays, special events at places like to zoo and so much to do it is just impossible to see it all. One of the best parts of DC is much of it is FREE! The Air & Space Museum, National Gallery, National History Museum, Capitol Building, Thomas Jefferson Memorial, Lincoln Memorial, Arlington Cemetery, The White House and much more are all FREE! I saw a traveling exhibit on Elvis recently. This photo exhibit showed what was going on when he was just starting to hit it big and it was a wonderful view of what it must have been like before his life changed so dramatically. The amount of history in this area is amazing. From a visit to the National Archives where the Declaration of Independence sits to the Capitol Building or The White House, we house some places where decisions are being made every day that effect the entire world. I am so glad you enjoyed this visit for Spring Break! The HomeAway.com Truckster stopped here and hosted a blogger in this house. It was very roomy and extremely clean! The blogger enjoyed here stay there and loved how gigantic the beds were. The owners also left a very nice personal gift for her and her child that was very appreciated by both. We made it to downtown D.C. in no time and also to a Bowie Baysox game very quickly. The house is in a great location in D.C. where it's not a long drive to any of the main sights. It's also roomy enough to host your entire family! In addition, it has both a front and back yard for the kids to play in. Perfect for bringing the family to the nation's capital! Thank You again for selecting my home to visit and for the wonderful comments! It really is a GREAT home! Please come back again! Our stay at this property was incredible. We had a great time and Patricia was more then helpful every step of the way. She was more then willing to answer any questions we had. The house was beautiful as well and had more then enough room for all of us. We spent much of our time in the dining room sitting around the table playing games and conversing. There was also a nice table in the back yard where we spent time. Also for anyone who wanted privacy there were plenty of places for them to go. Washington DC Smithsonian, Air & Space Museum, Congress, White House, Washington Monument, National Archives, Arlington Cemetery, Newseum, University of Maryland, Catholic University, Thomas Jefferson Memorial, Lincoln Memorial, Library of Congress, Capitol Building, White House, Business District, Georgetown, Annapolis, Inner Harbor Baltimore Maryland, Six Flags, Baltimore Aquarium, NOAA, USDA, many, many more!